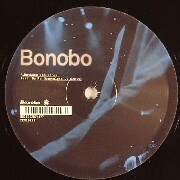 Simon Green aka Bonobo returns with a 10" single featuring remixes from his highly acclaimed album, "Days To Come." Nostalgia 77 remix "Between The Lines" and bring out the soul-jazz side of the original with lighter, shuffling drums and an increased emphasis on baritone sax and flute. New Yorks Mice Parade, on the other hand, use the cello theme from "Recurring" and build it into a signature (and awesome) guitar-drone catharsis. From playing the Luminaire, Bonobo is now selling out venues like the Forum in Kentish Town and has nearly 10 million listed plays on Last FM. His new album is coming soon. This should keep you busy in the meantime.